Wednesday 30/01 Workout plan. Leg day! HomeEXERCISE AND FITNESSWednesday 30/01 Workout plan. Leg day! Good day my able fitfam! Wednesday Workout plan. Leg day! Accountability is very important. Try as much as possible to do all the stated exercises and drop a report in the COMMENT section when you're done for the Coach/Admin to evaluate you. The format for reporting your daily routine is like this: "Workout completed, Number of cups of water taken etc. - Sleep well every night (7-9hrs will suffice). Poor sleeping habits can hinder weight as it raises your hunger hormone called ghrelin and decreases levels of the satiety/fullness hormone called leptin, which could lead to overeating and weight gain. - Drink a cup of water upon waking up to cleanse and detox your system. You can also take Warm lemon water. - Warm up & Stretch before the exercise. 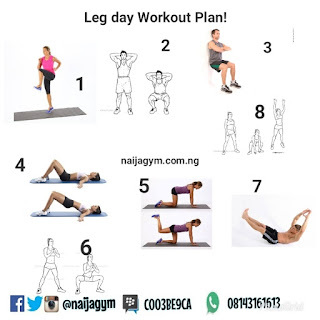 - Do all exercises as Stated in the picture above. - Post-workout meal(s): drink milk or any protein shake. Milk contains calcium which is good for the heart, bones, suppresses appetite which leads to weight loss. It is also proteineous. - Eating After a Workout Is Important. After your workout, your body tries to rebuild its glycogen stores and repair and regrow those muscle proteins. Eating the right nutrients soon after you exercise can help your body get this done faster. It is particularly important to eat carbs and protein after your workout. Foods high in Soluble fiber like oats, barley, nuts, seeds, beans, lentils, peas, and some fruits and vegetables will do. Also, eat all foods in moderation. - Fruit/Vegetable of the day: Any fruit or vegetable will do. - Drink 8 cups of water or more per day. Invite your friends to join in and make it fun! Please dont forget to drop a comment in the comment section when youre done! Want a specialised meal and exercise plan that ll help u lose fat quick?